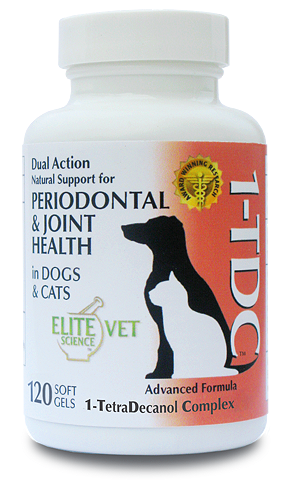 1-TDC provides next-generation fatty acid oil properties far superior to standard oils, offering improved joint health - plus prevention and treatment for your pet's gums. An effective combination of joint and periodontal treatments, 1-TDC Dual Action helps to keep your companions happy and healthy by treating joints and gums with an advanced, all-natural solution. These soft gels are easy to administer and palatable for both dogs and cats. Dual Action: Squeeze out capsule content directly onto upper gums. Apply to nose of finicky cats to lick off. Joint Health: Feed capsules/contents to pet as a treat. Under 25 lbs - 1 capsule daily for 30 days and then 1 capsule every other day thereafter. Over 25 lbs - 2 capsules daily per 50 lbs for 30 days and then 1 capsule daily per 50 lbs thereafter.